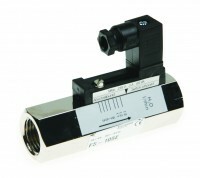 The FS-105E model flow switch operates in any mounting position. It is equipped with a calibrated piston which is displaced by flow to magnetically actuate a sealed hermetic reed switch. When flow decreases a positive spring returns the piston to its prior position and de-actuates the reed switch. The reed switch assembly is movable to allow for customer setting of flow rate within the limits of the switch selected. The adjustment does not effect the flow path, therefore pressure drop is not influenced when changing set-points. Versions are available for Liquid and Gas flow. Robust components allow a pressure of 250 bar, ideally suited for high pressure cleaning and lubrication systems.